Get out those rusty knives, y’all! 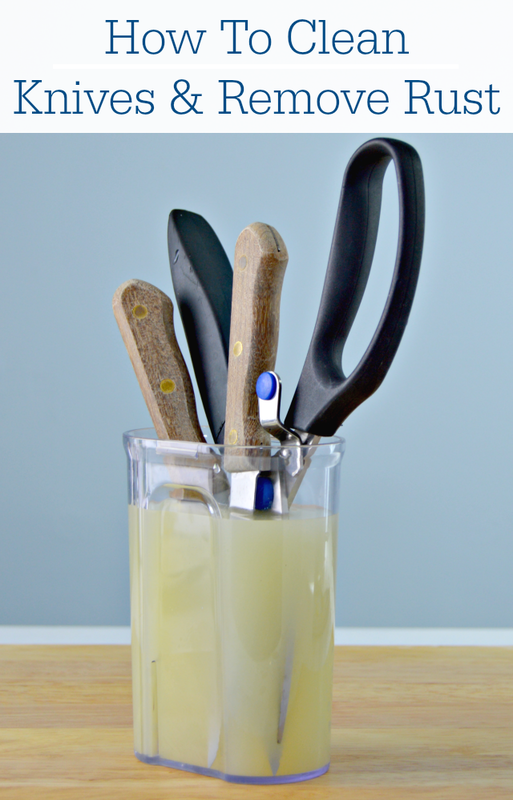 This tutorial on How To Clean Rusty Knives Two Ways will help revive your rusty knives and bring them back to life! I’m going to be the first to admit that I haven’t always taken care of my kitchen knives the proper way. I’ve thrown them in the dishwasher, left them soaking in water, used them to open random packages and even used a few of my knives as a flat head screwdriver. 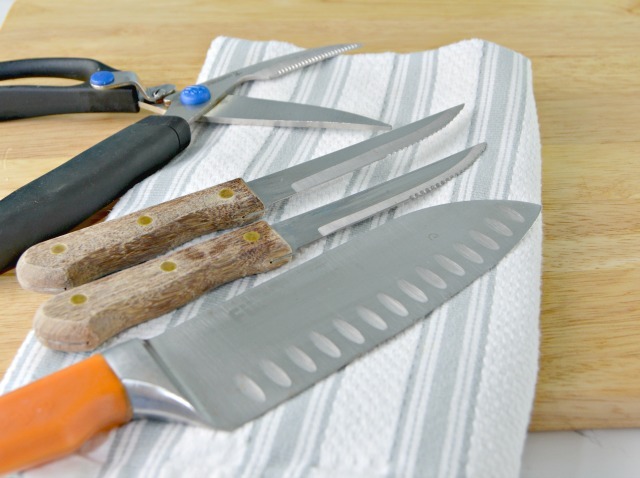 When you don’t take care of your knives, they can become rusty and unsafe to use on food. 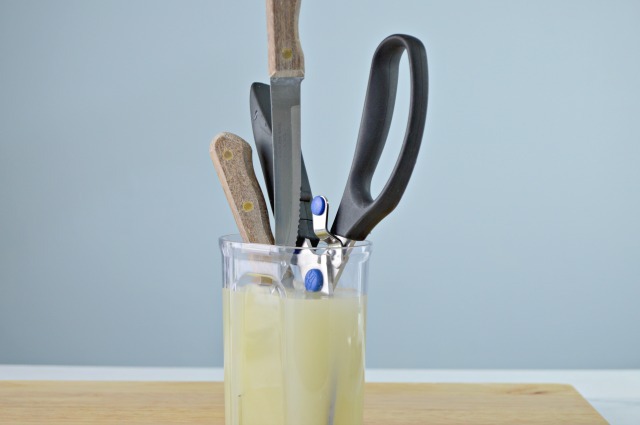 The good news is, you can clean them up and revive them with a couple of items you probably already have in your kitchen! Time to get them clean! And rub the salted lemon into the rust stain. 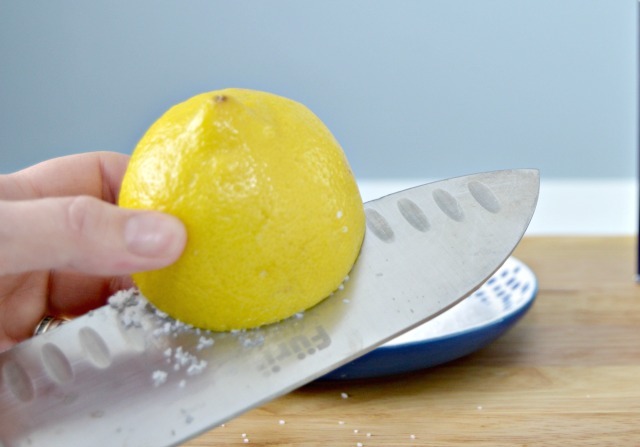 ***Be careful not to cut your self on the blade of the knife*** The acidity in the lemon mixed with the abrasiveness of the salt will help lift and remove the rust from your knives. This method may take a little effort, but it works wonders! The second method I want to share with you is even easier, but doesn’t work as well on super rusty knives. 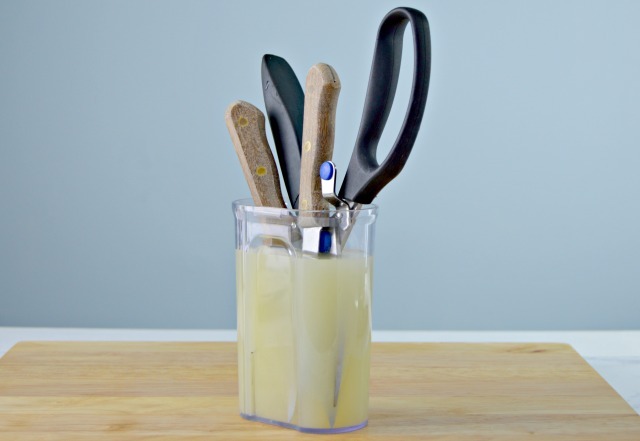 You simply soak the stainless steel part of your knives and kitchen shears in lemon overnight. 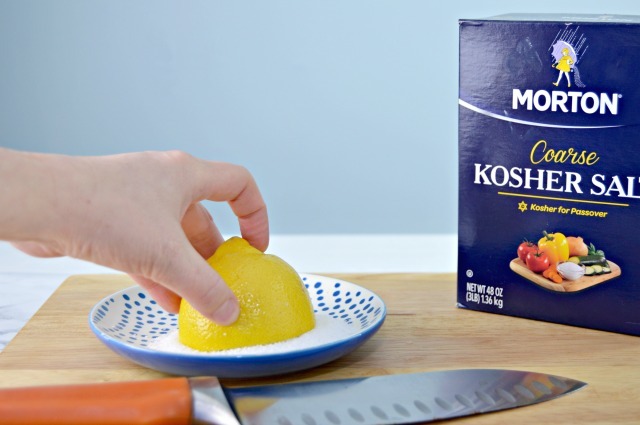 The acidity in the lemon juice will lift the rust away from the knives. In the morning, just pull each knife out, rinse it with warm water and dry it with a clean towel. Pretty impressive, huh? Now that my knives are clean and rust free, I am vowing to treat them with more respect. No more dishwasher, no more opening Amazon packages and no more soaking in the sink in water. 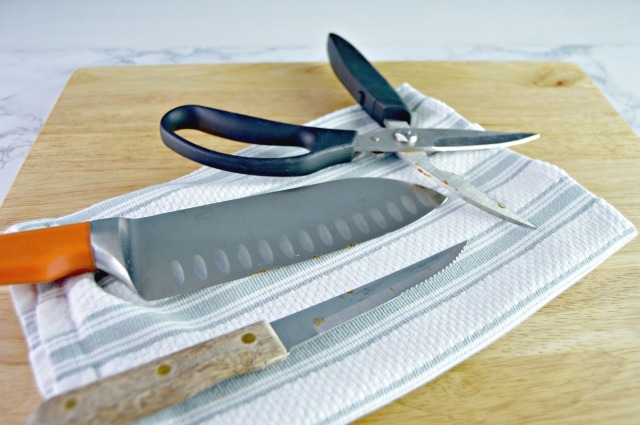 One of my awesome readers, Sandy wrote in and shared an tip to add once you have cleaned your knives. Sandy says, “After cleaning, coat with light coating of vegetable oil, or for long term bee’s wax.” What a great tip, Sandy! Thanks for sharing! Like this cleaning hack? 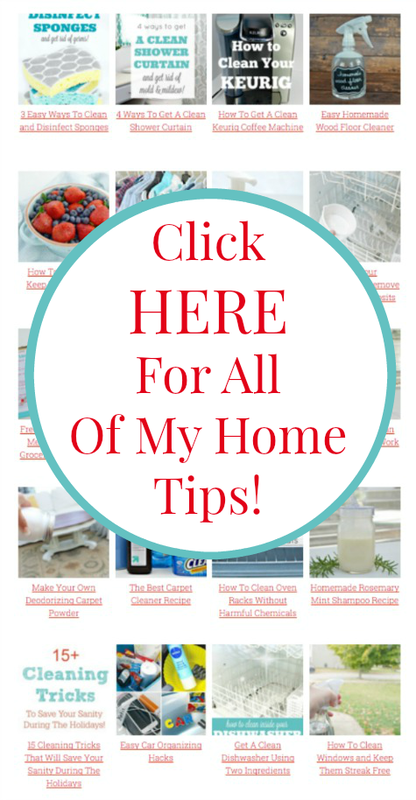 Check out hundreds of cleaning hacks and home tips HERE on my Home Tips Page! Rust? Try Coke, makes wonders! I love this post. I actually have a pair of scissors hidden in my kitchen. The ones in the knife drawer are for the rest of the family to use. I do use them for packages and such. 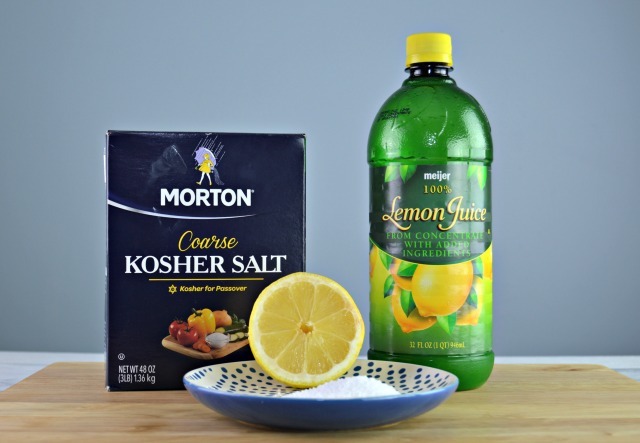 Can I use regular salt or has to be the kosher salt?